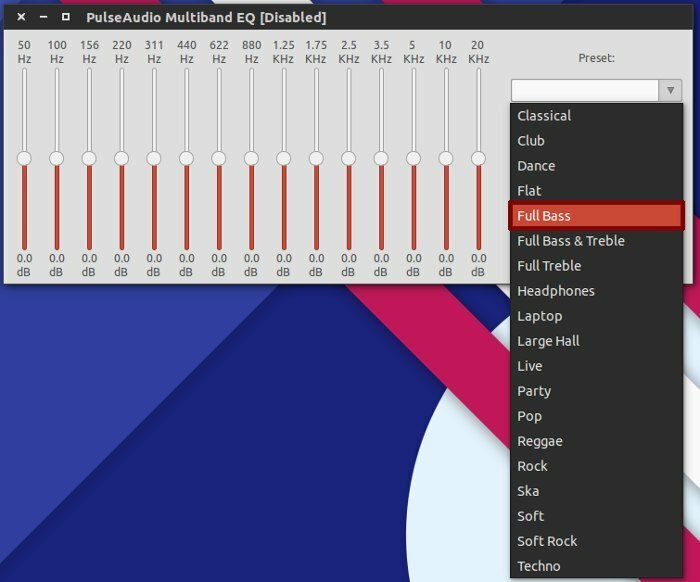 If you’re an audiophile as well as a Linux user, you might have a big issue with Pulse. You might find yourself disappointed that you can’t tweak your entire Linux sound setup (at least easily) to have an equalizer. Bummer, right? Not to worry, it turns out, as someone has created a piece of software that makes it fairly easy to get a system-wide equalizer up and running. It’s called pulseaudio-equalizer. Note: pulseaudio-equalizer is no longer being worked on, so if you run into any bugs or snafus, you’re out of luck. Simply open up a terminal window and add this PPA to your system. After adding the PPA, you’ll need to update Ubuntu’s software sources to reflect the change you’ve just made. This equalizer program is straightforward and easy to use. To use it, just look for pulse audio equalizer in your menus and open it. Once it’s installed, all you’ll need to do is launch it to bring up the main configuration window. From here, just go to the pre-set drop-down menu, scroll through the list and select the equalizer pre-set that you feel sounds the best with your computer’s sound system, etc. After that, just select the EQ Enabled box, the “Keep Settings” box and click the Apply button. This will apply the equalizer’s settings directly to the Pulse sound system (it’ll also take over as the main audio output in Pulse). Your newly applied settings should go into effect almost immediately. 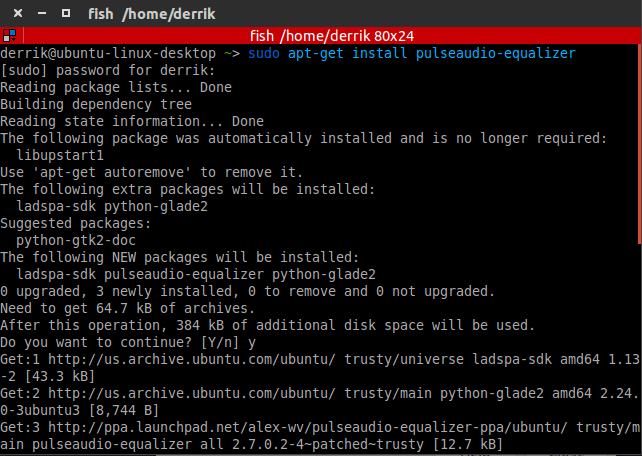 From then on, all audio played through your Linux install will be filtered through your newly applied equalizer. There shouldn’t be any issues, as this program is stable and works quite well on Ubuntu. If you have some problems with the equalizer starting up right away (after installing it and configuring it) just log out of your session and then back in. In 99% of cases, this should fix the problem. Alternatively, you could head on over to the Ubuntu sound settings, have a look around and tweak it. Pulse Audio Equalizer is part of the reason that I’ve always favored the way Linux does sound. It might not be the most polished, but the fact that some guy can write a program that solves a problem so that you can quick install it and have it interact with existing tech is awesome. I can’t overstate that fact. I hope that this program has helped make your audio experience on Linux even more awesome than it was before. Enjoy it! Know of some other equalizers on Linux worth checking out? Sound off in the comments below! While Pulse Audio Equalizer may improve the sound coming out of a linux based computer, I doubt out-of-the-box Ubuntu would satisfy a true audiophile. Much better approach (although waaaay more complicated) would be to install Ubuntu minimal, add alsa stuff and install jack sound server instead of pulse audio. After that much better (professional grade) EQ software can be attached via qjackctl: EQs by LinuxDSP (It is proprietary, though) or by Calf-plugins. Simpler way is to install special audiophile distro, Audiophile Linux (www.ap-linux.com). I’ve been using the Pulse-audio Equalizer for years, both under Ubuntu and now Mint. People should know from the save button provided (or easily figure out) that you can setup and save your own audio profiles in the equalizer as well. Start by modifying one of the existing profile settings as you need and then save. Be careful though. If you name a profile something like voice-1 and need a voice-2 (or 3) you’ll lose your work unless you change the name by adding the 3 first, then back-filling the “voice” portion of the name after. Type voice first and your new settings will revert to the existing voice profile(s). For those of us running Mint there is also an applet to launch the settings mode (or turn off the equalizer) from your task bar, appropriately named Equalizer from ps-equalizer@jschug.com and available applets control panel. I am using Ubuntu 14.04.02 LTS and I could not get it to load. Loaded pulseaudio-equalizer version 2.7.0.2.4-patched-trusty. It shows up in unity but will not launch. What gives? when you have added the repository. Is there a way to add a band to this EQ ? Thanks I used this on a prior installation but could never find it ibn the software center. it rocks. I recently returned to linux mint and prefer to use kodi for all of my media and it lacked an equalizer. This really worked for me, Thanks alot!! Linux Mint 17.3, ASUS M5A78L-M /USB3, FX-4350 (4.2gHz), 8 gb ddr3 1600mHz, Corsair 120 gb SSD. I rewrote this equaliser in python, as I didn’t like the complicated scripting that sits behind this program. 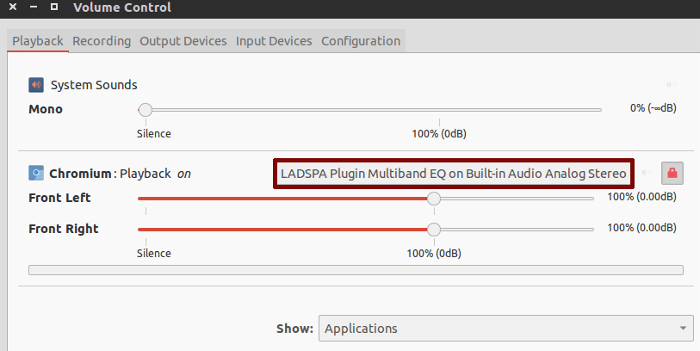 This Linux python utility provides a GUI front end to modify the sound of audio using pulseaudio’s ladspa module with Steve Hariss’ mbeq_1197 and Frank Neumann’s split_1406 plugins. Multiband equaliser and Mono to Stereo splitter respectively. The Bauer Binaural filter is built in from version 1.4, which is designed to make long headphone sessions easier on the ear.